As most readers will know by now, the British Election Study’s probability survey found no evidence of the substantial spike in turnout among under 25s at last year’s general election that, prior to its publication, was widely thought to have occurred. This finding was disputed by a variety of people, though it’s perhaps notable that they don’t – as far as I’m aware – include any of the pollsters that thought a youthquake occurred at the time. In response, the BES team published a thorough and highly convincing riposte. One of the two main reasons why the youthquake narrative took hold in the first place was that conventional polls had shown just that. But as I’ve pointed out before, polls have great difficulty measuring turnout in general and among young people in particular, and so are less reliable than the BES. The other reason (besides anecdotal nonsense) was the sharp increase in turnout in university towns, something that can be explained by the ecological fallacy (and to which I’ll return in a subsequent piece). But although gold-standard, individual-level data is always preferable, ecological analysis (when done sensibly) often works far better than it’s given credit for. Did it break down here, or was it just done badly? Before I dive into the numbers, let’s take a look at the seats where turnout went up the most. Picking up trends just by eyeballing constituency results (rather than actually modelling the data) isn’t easy, but there are a few clues. 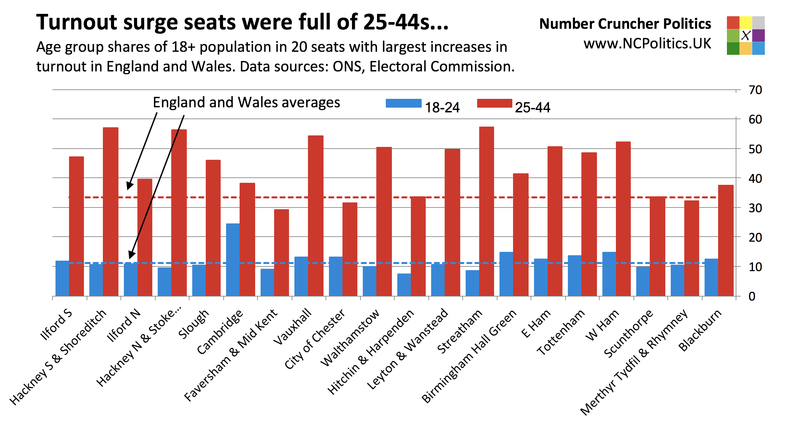 The next two charts show the number of 18-24s and 25-44s, as a percentage of the 18+ population in the constituencies shown. (Note that I’ve limited this analysis to England and Wales, because Scottish turnout was unusually high in 2015, being only 8 months after the independence referendum). This is a good illustration of the youthquake fallacy. For each extra percentage point in youth share of the adult population, turnout increases by about 0.05 percentage points. So on that basis, a hypothetical constituency with 100 per cent 18-24 year olds would have an increase in turnout of about 8 points (100 times 0.052 plus the intercept of 2.7). Of course, this model is misleading, because it ignores other age groups, and how their sizes correlate with that of the youngest group. This implies something remarkably similar to the BES numbers, with only the 25-44 age group variable being statistically significant, equivalent to a 12-point increase in turnout among that age group. And the 18-24s coefficient is slightly negative, just like the change in the BES data. (That doesn’t mean youth turnout definitely fell, but it certainly doesn’t support the idea that it rose). 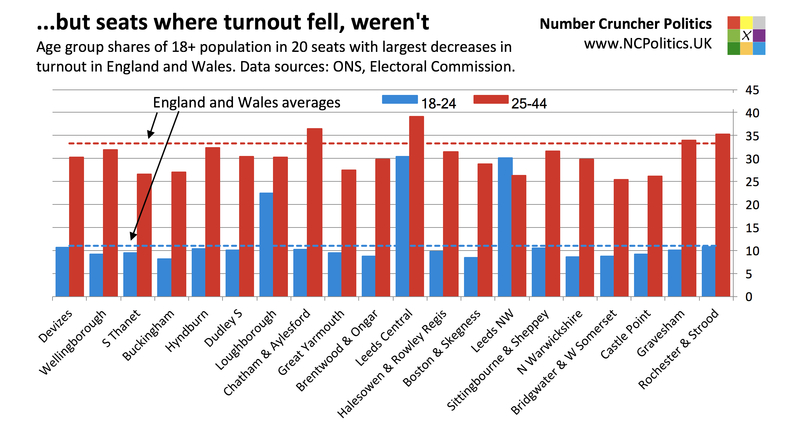 So the story here is almost identical to the BES: when both variables are included, the amount by which turnout changed in English and Welsh constituencies between 2015 and 2017 is explained by the proportion of 25-44 year olds, not under 25s. 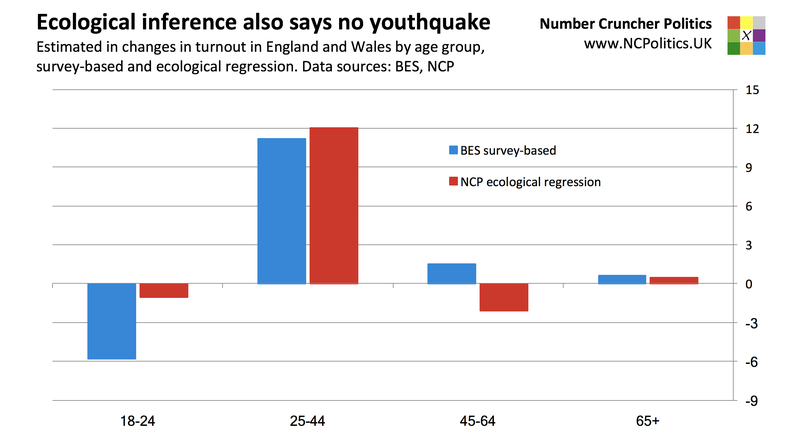 As such, even the ecological case for a youthquake is on extremely shakey ground – there’s a much stronger ecological case for youth turnout being about the same as in 2015. That leaves only the conventional polls – which have a known problem in precisely this area – suggesting a surge in youth turnout. Perhaps now, we can finally put the idea of a youthquake to bed. Really.